Eat your way around Glasgow with our city centre lunch guide. As 12pm looms, there’s only one question in the office: What are you having for lunch? 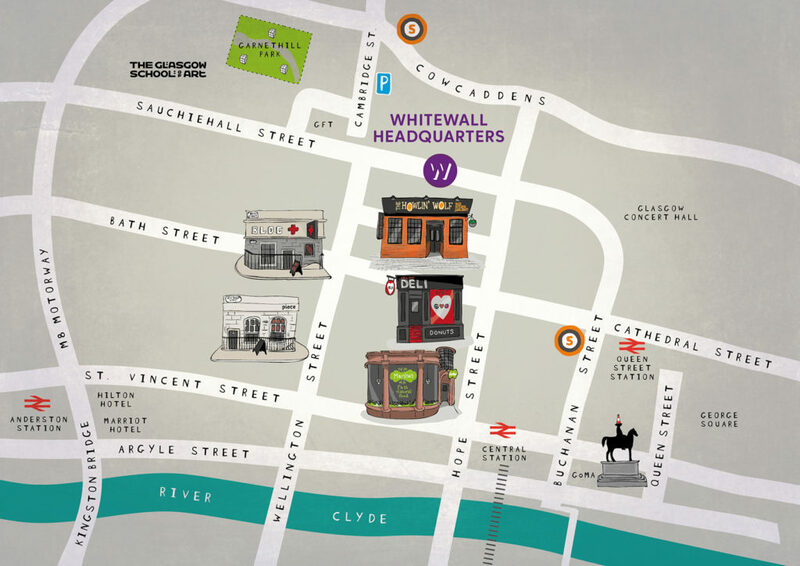 If you’re new to Glasgow or just need a good lunch recommendation in the city centre, we’ve got you covered. We’ve listed our favourites below, with the help of some lovely illustrations by Mark McDonald, our resident artist and designer. Home to our favourite pieces (non-Glaswegians, to you this is a sandwich!) we love the masterpieces on offer here. From the Bahn Mi to your more standard Pastrami, there truly is something for everyone. Our office favourite? It’s a toss up between the Chicken Olé or the Beef Classic. Don’t forget the sweet treats either – the teacakes and brownies can be saved for 3pm tea time. Home of the original Whitewall dirty lunch! Whether it’s 2 for 1 pizzas to takeaway or a team lunch sit-down, Bloc has brought us much joy over the years. Of all their daily specials, Kentucky Thursday and Dog Friday are the highlights. That’s not to mention the cracking poutine you can have on the side. When someone shouts ‘Bloc?’, this is one we rarely say no to! Our ultimate lazy lunch destination. Tucked away behind our office, this chilled-out bar and kitchen does all the classics. After trying most of the menu, we just keep going back to the lunchtime taco deal with a few sides. Errands to run? Take your taco away and munch on the go! Located a bit further afield than most of our other lunch spots in Glasgow city centre, this one tends to be a group outing. The fast and healthy rice boxes are super tasty and the walk definitely helps to increase our steps! We can’t get enough of the Chipotle Chicken (extra salsa, slaw on the side). If you can make it there before work, the bacon rolls are pretty delicious too. Home to most of our weekly baked potato feasts, Nic’s is where it’s at for Nachos, salad bowls, and sandwiches. Did we mention they do donuts? Big ones. Covered in chocolate. YUM.